In Brief: A looping walk over tricky terrain and unrestored Great Wall on the west side of Jiankou. 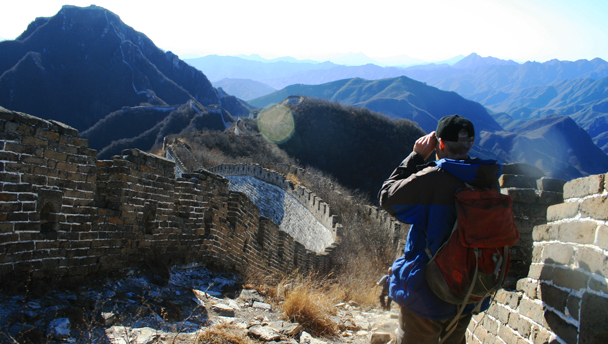 A hiker using binoculars to get a closer look at a stretch of the Jiankou Great Wall. 3–4 hours start to finish over 8km. This is a looping walk over steep and rocky terrain, with a lot of scrambling and climbing required to arrive at the highest point on the hike, the impressive Nine-Eyes Tower. On a clear day in this spot in the heart of the mountains it will be possible to see the towers of our Great Wall Spur and Chinese Knot hikes, and the Mutianyu Great Wall, with glimpses of other sections of the Great Wall that follow nearby mountain ridges. There are many sights of interest along the way, from ancient history (volcanic rocks and other geological features) to Northern Qi and Ming Dynasty* constructions, as well as signs of more recent use of the land. We start out on a trail out the back of the village at Jiankou, climbing up and over a ridge and down again through a forest into an area that was used to farm cows. The stonewall cattle pens are still in evidence, although hidden in the undergrowth. We’ll gradually head up the valley, turning off to climb a steep trail that leads to Er Dao Bian Tower, the start of the Nine-Eyes tower loop. Er Dao Bian roughly translates as ‘Two Roads On Each Side,’ and at this point in the hike we’ll be at approximately 900m above sea level. On the way up, keep an eye out for a massive free-standing chunk of rock, and an ancient stone oven that was built at the same time as the Great Wall and was still being used in the 80’s. Nine-Eyes Tower is even higher – almost 1,200m above sea level. In its original condition it had three levels, and the lower level had nine windows on each side. It would have been an impressive sight, and still is to some extent. It has been slightly restored – the floor of the third level is now the roof, and the interior is very spacious compared to other towers in the area. Around the back of the tower there are large stone tablets to look at. A spur of the wall continues to head north; we’ll head west on another stretch, following the wall to a spot with a view of a ancient walled army barracks before retracing our steps to find the hill trail that will take us back to Er Dao Bian Tower. After everyone is back at Er Dao Bian Tower, we’ll follow the wall south towards the Chinese Knot section, passing around and over ten towers on a stretch of wall known locally as the ‘Big West Wall’. The first four towers are not in the best condition, and the trail we take sometimes skirts around sections that are too steep or too broken to walk on. After a while we’ll be back on to more solid footing, and we’ll get excellent views of the Big West Wall: solid and uncommonly tall foundations made of huge carved rocks topped with Ming Dynasty (1368–1644) brickwork and towers. On a clear day we’ll be able to see how much Great Wall is in this area – rather a lot! – and we can sometimes see all the way over to Mutianyu, a famous tourist section of Great Wall. At the tenth tower of the Big West Wall, just below the Chinese Knot, we’ll leave the wall and follow a trail back to Xizhazi Village – steep and slippery at the beginning, flattening out as we pass through a lovely forested area and the villagers’ orchards and fields. Our bus will be waiting for us at the village carpark, and we’ll unpack our picnic tables for snacks and cold drinks before we head back to Beijing. No pizza this time, sorry! In the trip reports listed below you’ll see a pizza hike. That’s a special arrangement, and we’ll be doing another one of those next year! There are some steep and slippery sections on this hike, particularly while on the Great Wall. Not recommended if you are not good with heights. We cross a few parts of the trail where bricks and gravel are very loose underfoot. Check out 13 photos from a hike up to Nine-Eyes Tower, at the Jiankou Great Wall. See a set of 8 photos from a cloudy day’s hike up to Nine-Eyes Tower at the Jiankou Great Wall. See a set of 38 photos from our hike up to Nine-Eyes Tower at the Jiankou Great Wall. 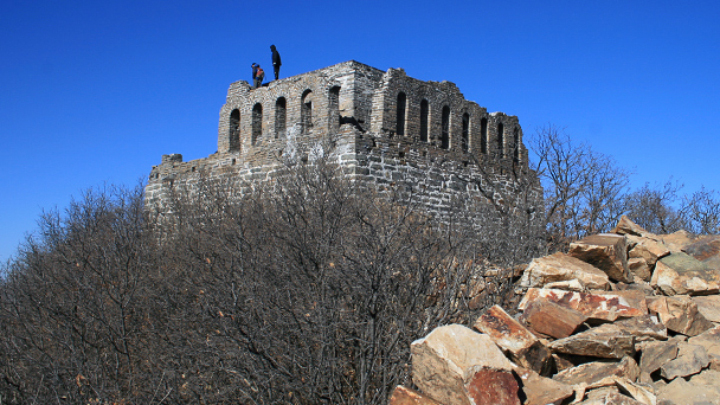 See 20 photos from our hike up to Nine-Eyes Tower at the Jiankou Great Wall. Sixteen photos from our first proper hike in the snow this winter. This hike is one of sweeping views, natural beauty and an enjoyably rustic section of the Great Wall at Jiankou . Even though this hike is a tough one, it’s well worth doing, especially with the prospect of a feast of pizza waiting for us at the end. Click through to see more photos! This hike takes us up to a Great Wall Tower with spectacular, sweeping views of the Great Wall at Jiankou, the Chinese Knot, as well as the section we walk on the Great Wall Spur hike. The hike is a reasonably tough one but is well worth the effort. Click through for photos and more! Photos and statistics from our visit to the Nine-Eyes Tower - click through for a look!